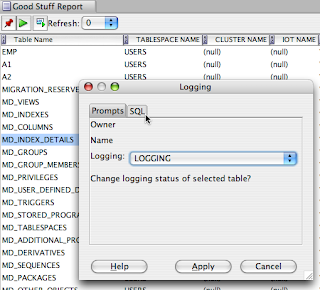 In this post, I'll show how to add a context menu to a report. The same thing can be done to a tab which has been added which is described in Question #1 here. For more on the <display> tag see this post. For more on the <item> tag see this post. Here's an xml file of the 2 combined. The things to look at are that the <item> is inside the <display> . 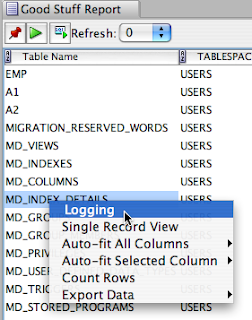 Then look at the bind variables :TABLE_NAME which will be taken from the row clicked on in the grid. Lastly in the sql and confirmation there's #TABLE_NAME# which will also come from the row clicked on and do a replacement of that text.